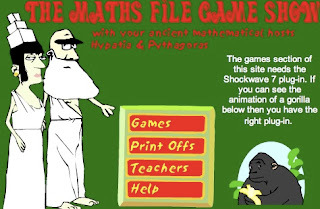 Do you want to let your students practice maths in a fun way? 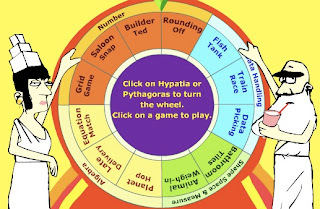 The Math file game show is design to do that with the ancient mathematical hosts Hypatia and Pythagoras. The site is provided by BBC education and it includes on-line games as well as games available as printouts. The games are available in the following categories: numbers, data handling, algebra as well as shape, space and measure. The on-line games are always available for three level of difficulty. The games use they Macromedia Showckwave technology, making they visually attractive. The printouts include games and exercises such as cross number, snap charts, writing cheques, budgeting and spending and sorting books based on the Dewey system.